Conventional maps show the shape of a country according to its land mass. But what if you drew a map according to where people lived? At first glance they could be mistaken for distorted creepy-crawlies - bloated body parts with randomly placed antennae and spindly legs, their gridlines looking much like the compound eyes and variegated wings of an insect. In fact, each image is a country map - reinterpreted by a pair of Sheffield University geographers. The result is a remarkable series of cartographic designs that cast the world in an entirely new light. 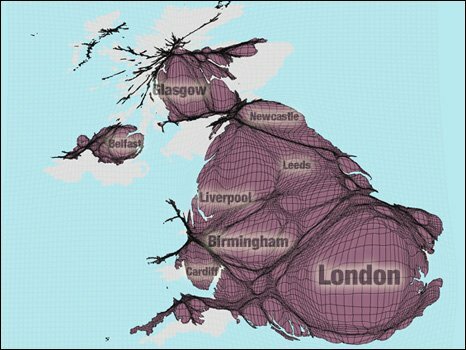 The map of Britain above, for example, is a reworking of a traditional map using data about where people live to highlight population density across the country. It emphasises the dominance of London and other cities and the lesser significance, in terms of headcount, of more rural parts of the UK. Professor Danny Dorling, who oversaw the creation of these maps, says it captures what is most important about a country. "It changes how you think about places," he says. "If you really want a fair map of an area you do it by population. What you are interested in most of the time is people." Prof Dorling, and fellow geographer Ben Hennig, a PhD student, have plotted census data for some 200 territories. They are mainly United Nation member states plus a few others, to cover at least 99.5% of the world's population. You can view some of them by clicking on the link above. The pair have also animated six maps exclusively for the BBC News website (see below). See the pictures the animation is based on. Producing the maps, or cartograms as they're known, has taken months, says Mr Hennig. National census data from countries around the world have been combined with UN data to compile the most accurate picture for population distribution around the world. Next, a map of each territory is divided into a grid of squares of equal size. The data is then fed into a special software programme that plots the number of people living within each square. This is no mean trick, says Prof Dorling. "I spent the first 15 years of my academic career trying to work out how to do this," he admits. In the end physicist Mark Newman, a "genius" says Prof Dorling, worked it out with one of his PhD students, Michael Gastner, over a relatively short time and wrote the software. 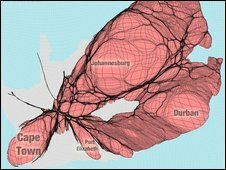 "What we're trying to do is create the correctly proportional, least distorting, population cartogram," Prof Dorling explains. His hope now is that these maps will catch on and someone will take the next step which is to write software that will enable anyone to input their own data and produce a map. It goes to show what may seem a silly idea (when you first think of it) is actually a scientific way of producing a more meaningful map - I'm certain this idea can taken further to include food consumption, food waste and many other things which make our world tick. How about insect, fish and other similar categories - the options are limitless. Now if the good professor, or another, would create a map reflecting the consumption patters of a country, rather than just the population size; I wonder what type of creatures we might see? Its probably a little bit irrelevant but have a look at Finland, it looks like a massive teddy bear with funny ears! Now if we can take this another step or two further and find a way to incorporate translocal flows (e.g. of people, of commodities, of capital) and then built it into a three-dimensional model, we could actually have a stunning visual representation of what so-called "globalization" is doing. Better yet, make it 4D so that we can show change over time... of course, a lot of the necessary data for that will be speculative or sketchy, but it will at least reveal that Thomas Friedman's flat world is anything but! It's lumpy, it's disjointed, and it's complex. This is not the first time I have seen this sort of map. Kew gardens have two maps like this, one representing where all the plant species are in the world and the other representing where the funding is. The two maps that were generated where dishearteningly different. It would be very interesting to see a map such as this of where the wealth in the world is. Back in the 60s I purchased a paperback atlas for students that had a similar world map, with the countries represented by rectangles whose area was proportional to population. I remember being impressed, and a little disturbed, by how huge the island of Java appeared on that map.